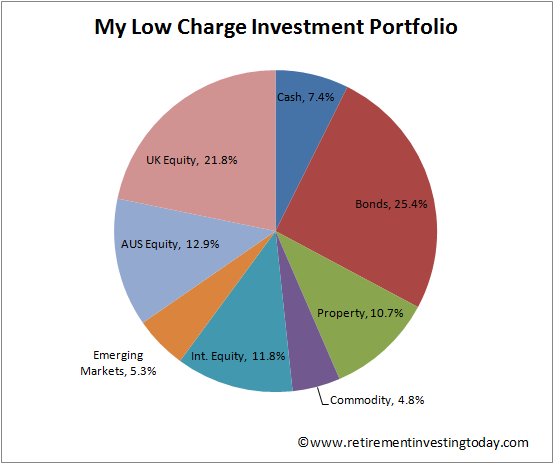 My low charge investment portfolio today holds 7.4% of my total wealth in cash. I currently use 2 main repositories for this. The first of these is a Yorkshire Building Society (YBS) Savings Account which 6 months ago was earning an interest rate of 1.25% AER. Looking today they seem to have stealthily reduced that to 1.24% AER for which I have received no notification. YBS, if you’re reading this, I hope you make good use of that extra 0.01%! As a higher rate tax payer and with inflation now running at 2.1% this savings account is allowing my savings to be eroded at the rate of 1.36% per year. So every day that goes by a pound held in this account has less purchasing power than it did the day before. I’m going backwards. If you happen to be a basic rate taxpayer then you’re also going backwards, albeit at a more leisurely 1.11%. Little to no movement here is of course no surprise given the latest average savings account data from the Bank of England shown in the chart below. It shows instant access savings rates up a mere 0.03% in the last 6 months. What alternative do I have? Well moneysavingexpert.com tells me the Santander 123 current account which pays interest of 3% AER on balances between £3,000 and £20,000 is still hanging around. It of course also comes with a monthly fee and minimum deposit requirements but it also offers cashback opportunities although I already get that with my American Express Platinum cashback credit card. Personally, I prefer clean simple accounts and today that looks to be Coventry Building Society with a 1.4% interest rate but these accounts can’t be run online. I mean honestly an account that cannot be accessed and managed online. Do the Directors have shares in Royal Mail or something or are they just trying to grab headlines... For now I’ll just leave what I have in YBS and continue to deposit new savings into my second newer different risk profile repository, Peer to Peer lending (P2P). It is now 6 months since I started my P2P experiment with RateSetter. I am continuing to choose to lend over 3 years and at the time RateSetter was telling me I was receiving a 4.7% weighted average rate. Today that has slipped slightly to 4.5% but in recent days I’ve noticed my reinvestments achieving 4.9% so over time it might creep back up a little. More on that later. Of course I knew I wouldn’t actually achieve that rate. It was one of the Con’s I identified in my original post on the topic. It is caused by the fact that new money and reinvested money (which includes lenders paying back their loans in full) can sit for a few days before it gets matched with lenders. So the million pound question is what rate am I actually achieving? Well over the last 6 months that’s a pleasing annualised 4.2%. After inflation and higher rate tax that’s giving me a positive 0.4% return. So at least I’m not going backwards. In my original post I identified a Con as “you can only transfer funds into RateSetter via direct debit three times for free. After this each direct debit costs £1.50. You can however transfer direct from your current account for free continually but that can take a couple of days depending on who your bank is.” They have now largely taken this Con away. Deposit a minimum of £1,000 and it’s now free to direct debit. 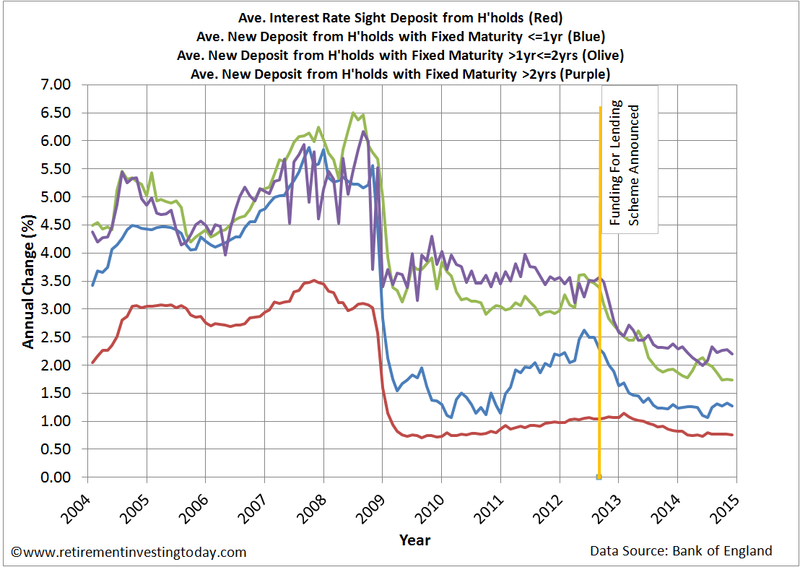 It appears as though RateSetter are currently struggling a little to get as many lenders as they would like. As I mentioned above recently some of my reinvestments have even achieved 4.9% in the 3 year market. RateSetter clearly want lower rates than this as on Thursday I received an email advising me that if I followed the T&C’s I would get £50 if I invested an additional £5,000 and £100 for £10,000. I’m going to take advantage this week and grab £50. This post probably sounds like a RateSetter advertisement so some full disclosure. I am not affiliated with nor received any benefit from RateSetter for this post. I’m simply, for now at least, a relatively happy customer. The platform is simple to use and seems to be doing exactly what it says on the tin with no nonsense. Are any readers using RateSetter or another P2P platform? How is your current experience? I'm using it. As you say, very easy to use, very straightforward. How long have you been investing with RateSetter RJ? I'm not intending to plough any more savings into my P2P, just reinvesting. At the moment, reinvestments are going from Ratesetter (and Lending Works) to Funding Circle - higher risks but I'm hoping to get annualised interest of around 10%. I'm still happy with how things are going - as you say, the platform is easy to use, it's all very easy to understand and as with any investment, there will always be an element of risk. You're far braver than me weenie. I'd be really interested in how Funding Circle works out for you as it wasn't for me. Maybe you could put up a post on your blog in 6 months or so? More curious than brave, I would say, haha! I haven't got a huge amount invested in P2P (max £2k) so was willing to take a bit more risk. Thanks for suggesting I do a post on Funding Circle - I'll perhaps do an update in July as then, I'll have had 12 months investing with them. For me it's a fair chunk of my eventual home purchase fund so I went much lower risk. Looking forward to the July post as I did consider them (briefly) when I first did my P2P screening. Thanks for the article, RIT, as always. I know you can be very fussy about a tenth of a percent here and there, and rightly so, but you have indirectly discussed here an element which you rarely mention in your quest for FI but which has financial value: the hassle factor! Time is money for investors actually doing some hard graft (i.e. not those working in finance) but how do we weigh up our time against a little money saved switching accounts? It is not just the time to fill out the forms, send in the varying number of certified bank statements and passport copies, etc (with their bizarre signature career selection guidance); it is also the additional unwanted mail, unwanted phone calls, unwanted 'products' and the like which will inevitably increase the more accounts you open. Consideration also must go to the time we waste reading through the occasional letter sent telling us about a change in T&Cs, or the uneasy feeling we get when, instead of sacrificing 30mins (or more) of one's life trying to understand the T&C's, we simply put it on the shred pile. I think in my life, opening a new account has to probably be worth roughly 0.4% interest benefit for my cash savings. And if the deal is only for a year then forget it; I would rather do something far more pleasurable with the time it would take me to do the research and fill out the forms. Re P2P Ratesetter. My micro business has monthly and 5yr investments and, like you, just went for the £50 cashback. The cashback thing made the cynic in me wonder if they thought they were going to have some defaults and needed some extra cash for cash flow in order not to blow their reputation of never having a lender lose... It is all working well for me but I have never withdrawn any money (though that process seems simple and understandable). Other than some management crookery I see the only problem happening if lots of people suddenly find they are having to default on loans; banks might get bailed but P2P? Hopefully that risk will not fruit but if it does then it will be too late. The biggest difference cf a bank account is that you cannot quickly pull large portions of your money back out without losses; if you suddenly see a massive UK default coming (it is unlikely I would ever see it coming) and you have your money out on a 3yr loan, what do you do? Very good point about cost vs reward. For me personal finance is as much of a hobby as it is my future so I possibly over do some elements. Just letting you know also that I direct debited the £5k on Monday night and it was in the market by early morning Tuesday at 4.7%. Smooth and no nonsense as usual. I think (and of course I'm often wrong) the cashback offer is simply RateSetter trying to drive down the yields. I noticed recently that they were creeping up and my money was also reinvesting quickly. My take is they had more borrowers than lenders so they are just trying to increase lender investment. Just wondering if you have looked at the fairly new investment trust - P2P Global Investments - if so, whether they may be a viable proposition? Seasoned Board of Directors, but with no track record this new IT is trading at a premium of over 9% to NAV (and a fair assessment of NAV is difficult to make). The new share issue thin month was oversubscribed. It seems to me the price reflects sentiment and the lack of other opportunities for retail investors in P2P companies -with the exception of GLIF which l hold and which I'm sure you know. At these prices l would up my stake in GLIF rather than speculate in overpriced P2P Global. The problem I see with such investments is that risk is not measurable. And who carries credit risk here? P2P company? some hidden borrower with unclear credit rating? Both? Is the risk less than company bond paying the same coupon? If less, why wouldn't institutional investors/banks invest there? This draws me to conclude that consumers underpaying for the risk. The whole thing smells like those structured products banks sells to retail clients - the value of those is much less than consumers pay but because valuation model is stochastic (due to some exotic options in the payoff structure) the public is unaware of the value of the instrument. Time for regulators to look into this. P2P in the UK is regulated by the FCA (since April 2014). What it doesn't have, is your money up to the value of £85k protected, like what the banks have, so yes, that's the big risk at the moment. To be honest, I can't see anything exotic or structured about P2P, it's pretty straight forward, with the usual investment risks involved. What do you call usual risks? That fact that borrowers cannot get the loan from a bank and have to go to P2P company means that they have high risk of default. The risk is not obvious to the lender-investor nor there is a professional manager who can quantify it. how would you loan be affected by interest rates? inflation? other indicators? You could compare a basket(/fund/etf etc) of corp bonds but I do not think it valid to compare the risk of the same investment in a single company corp bond. As a P2P lender your loan amount is spread over a number of borrowers; at time goes on and your interest is reloaned, it appears your money is effectively spread amongst borrowers more and more. Therefore, any problem with a single default is likely to be small. If you slap in a big lump sum then it is luck how the P2P company split it to borrowers but if you drip feed in then that should ensure your get lots of borrowers. Also, Ratesetter claim that not one of their lenders has ever been impacted by a defaulted loan. Therefore, in my mind, much of the risk is with the P2P company itself mismanaging/corruption or a mass default due to whatever. Yes, your fixed rate lending would become less attractive with an interest rate rise (as might a corp bond), but that is why the longer term lending has a higher interest rate. You make your own judgement. As to why wouldn't institutional investors/banks use it. As I see it, they just have their own private systems which they calculate will make them more money. By 'usual' investment risks, I mean that as with investing in shares for example, you may not get all your money back. How do you know that P2P borrowers can't get a loan from a bank? They may have chosen a P2P company because they offer competitive rates and flexible repayment plans. Companies such as Zopa and Ratesetter tend to only loan out to people with reasonable credit scores. With Funding Circle, who loan out to businesses, such businesses are graded from A+ through to C-. You can choose to just loan to an A+ company, who provides a Directors guarantee, get to see a business profile, credit score, financial summary and ask them questions. If you're not happy with any of the info, then you DON'T INVEST...it's simple as that! As the other Anonymous guy said, you loan very small parts to various different borrowers, so if one borrower were to default, it would be a small amount and many of the P2P lenders have some sort of back up to cover defaults. If I compare the 1.25% I was getting for my ISA account compared to the 10.4% I'm getting for my P2P, well, it's worth a punt, though I wouldn't put all my eggs in this basket! come on why stop at 10%? Just go to exchange and buy retail eurobond like EnQuest with current yield 13%! All usual investors risks,you may lose your investment, etc. I am sure you can find some even with 20-40% yield . Let's party! The issue is that borrowers likely belong to the same class of people/companies so they will be affected by adverse economic conditions all together. There is a reason why retail investors are called "dumb" money and professionals are "smart" money - they do analysis of risks, including company balance sheets before investing. That is why it is much smarter to pay something to professional managers who would select where to invest instead of gambling by buying single stocks or investing into something you dont understand the risks of. Now you are into the active vs passive discussion. How about you pay a professional to find a professional manager? Or maybe pay a professional to find a professional to find a professional manager. That sounds smart. All those active professional fund managers are doing so well. Good luck with your retail eurobonds and 20-40% yields and enjoy your partying - I'll stick with my P2P at 10% thanks - there's no need to be greedy, is there? Not really. Do u really think you save money in passive funds? First, index funds cannot 100% track the index, they need to make a choice which constituents to buy. Next, you still pay to index managers but implicitly. What I mean is that once a stock selected for index inclusion, it goes up driven by only the fact that it got added to the index. So you pay extra for the stock being in the index! About professional managers. Most funds supermarkets give you the choice of the "best" managers (some fee paid there sure) but at least they are more-less descent. Good to see some good discussion amongst readers starting to develop. I also agree with K on measuring risk. It is difficult (if not impossible) to really assess it and was a concern for me. That said Zopa customers seem to have made it through the last downturn ok, RateSetter have a Provision Fund which gives a little backstop and I also know P2P is no bond fund or bank savings account. That said I'm still dipping my toe in. To put it into perspective if I were to suffer a 100% loss today it would hurt me to the tune of delaying FI by about 4 months. I can live with that. Where K and I do differ is that I wouldn't pay a fund manager 1.8% let alone 1%. For me it's trackers all the way (except for my HYP which I cover here regularly). I believe that over the very long term, and I'm in this for the very long term, that I am better off paying less expenses with those savings compounding vs possible out performance by the manager. I've seen enough data that satisifies me the game is to track and minimise expenses. Yes you're right, I have only £2k sunk in P2P. I'm reinvesting the repayments and interest right now but when it gets to around £3k in a few years time, then I may start withdrawing the interest, to maintain my max exposure at £3k. Do the earnings of this stunt count as "interest" in terms of the up--to-£5k nil rate income tax band on interest for people with low earnings in 2015-16? I forgot to say in my previous post that I don't think many other financial institutions would allow the public to view anything about their loan books. I am an invester with The Funding Circle, Ratesetter and Assetz Capital. I have been with them all for just 12 months. I began by placing small amounts in each and spent time figuring how to make it work for me. I discovered that the loans to asset backed businesses at Assetz Capital seemed to to go wrong far to often. They pay around 10% and are the riskiest of the three. With The Funding Circle I used the auto means of investing and found that some of the companies ceased trading and the investment rate was less than if I did it myself. Since I learnt how to make my own assessments - based on several factors, but importantly on how the borrower responds to questions, I have acheved something like 7% after charges and losses. I like to invest in certain sectors and it gives a thrill to back businesses you like. Finally, Ratesetter is also a great investment. I use all terms from 30 day through to 5 years. The rates for lenders shot up just before the election and I locked in 4.8% for one year, 5.8% for 3 years etc. The rates change on the time.